We all love a little holiday... or a big one if we can help it especially when there is glorious rain outside! 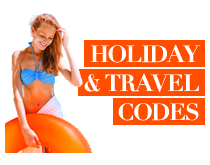 Booking some time off to relax is a necessity and so we have compiled some great discount codes to set you up on a fab holiday! If money was no object then we would all be on a continuous holiday all year round, however as money often dictates, breaks away can dent our finances. If we however can offer a few incentives in the form of holiday promotional codes, you may just find yourself sipping a cocktail on a beautiful island saving up travel stories to tell your jealous friends when you get home! So jump on it and use and abuse before you jet off!